Amazon is working on a massively multiplayer game, but it’s not the World of Warcraft clone you’d suspect. It’s a different beast entirely. 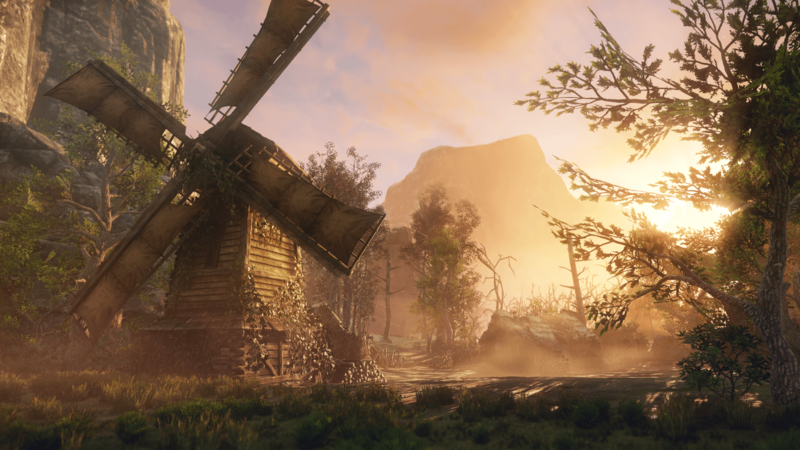 The game’s wholly original world mashes medieval, enlightenment, and early industrial themes with a wild frontier. Players set out to conquer this world, alone or together, gathering resources and building small societies. New World uses Amazon’s cloud tech as a backbone on which to build the world, making it possible for hundreds, even thousands, of players to coexist at once. We spoke with three of the game’s developers about why Amazon has backed a game that’s different from mainstream competitors, and how the cloud will be used to expand its scale beyond anything seen before. 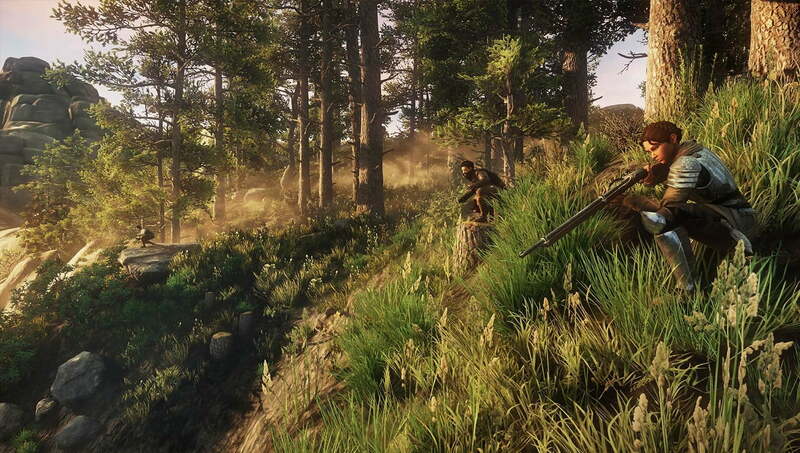 Matthew S. Smith, Senior Editor, Digital Trends: Just looking at a screenshot of New World makes it clear it’s different from ‘mainstream’ online games. It’s a bold direction for a flagship game from Amazon’s new gaming venture. Did the game’s core idea come about before Amazon’s involvement, or after? Patrick Gilmore, Studio Director, Amazon Game Studios Orange County: New World has been created wholly internally to Amazon. As a studio, we had been discussing the idea of an open-ended survival sandbox game. We love the thematic ideas of a newly discovered world, crude technology that might advance and mature over time, and the role that faith and superstition play in establishing an enduring settlement. And more than anything, we loved the idea of a frontier—a sort of boundary between the known and unknown, implying there would always be something new to discover. When we shared the original idea internally, the main question that came up had to do with scale. What if it’s not a game made up of small raiding parties of five or six, but whole armies? What if it’s more about building up—not just scraping by? These two concepts, a new world of superstition and discovery matched with new experiences that spring from enormous scale, drove our thinking. New World aims to have a huge map with hundreds, perhaps over a thousand, players populating it at once. Is that something that would be possible without the help of Amazon’s server tech? Gilmore: To host Aeternum, the “world” of New World, we created new back-end technology that scales a single game simulation over multiple hubs in AWS cloud. The back end is the glue that holds the experience together. None of it would be possible without the work our team did to leverage Amazon’s cloud. Rich Lawrence, Executive Producer, New World: It’s certainly possible to build multi-host back ends with a variety of approaches, so we don’t lay claim to that exclusively. But AWS is a great enabling environment for development. Hosts are available with the push of a button, deployment and monitoring are supplied by default. It’s less to worry about up front and the assurance of hardware scale is always there when you need it. If our team suddenly needs ten server sets for a test instead of one, that’s just a configuration issue. Many MMOs and online games, from World of Warcraft to Destiny, frequently separate players into ‘instances’ to keep player counts low. What made Amazon Game Studios decide on a different direction? Gilmore: We think large scale world simulations are an inevitable evolution of game technology. We don’t see it as an either/or situation, since even in the context of a massively shared space like New World, players will organize into smaller groups based upon play style, ease of communication and availability. But by breaking down those limitations, we hope to present a host of new kinds of gameplay, and radically expand the kinds of relationships that emerge among players, from traditional competitive PvP all the way through formation of in-game societies. Lawrence: I would echo it isn’t an either/or thing. Instancing can be a valuable to specific kinds of gameplay. We wanted large battles, and the feel of being in this constantly evolving society. That’s facilitated by larger player populations. In the end we went large because it just made gameplay more fun, for our game, for our setting. The term ‘MMO’ has become messy – these days, it can apply to many different games. 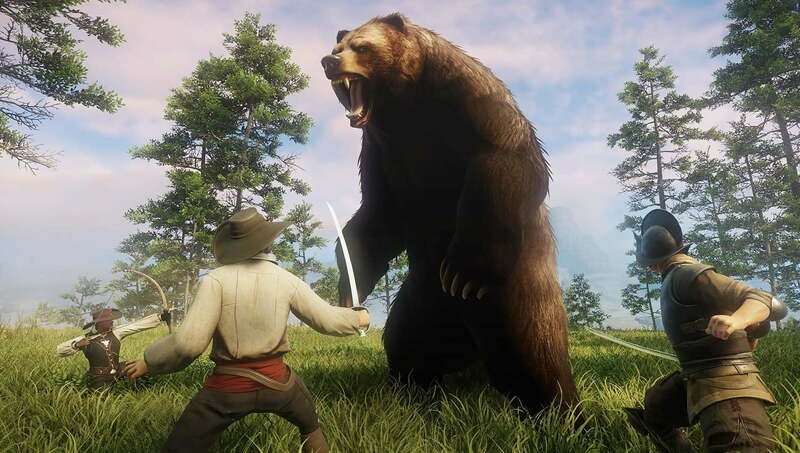 Does New World see itself as an alternative to a game like World of Warcraft? Or is it really in a different genre? Gilmore: I think if you take “MMO” at face value, which is to say, “Massively Multiplayer Online,” it’s still an accurate, but very broad definition. 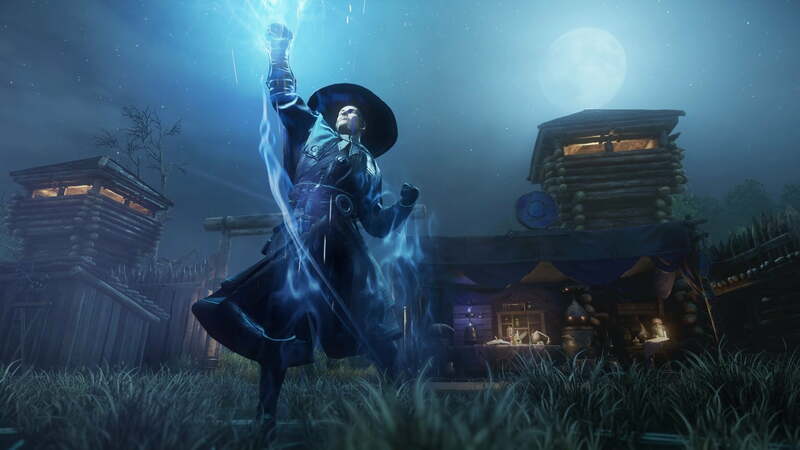 We refer to New World as a Sandbox MMO to distinguish between a player experience that’s more driven by scripted or crafted content, like World of Warcraft, or one that’s defined purely by player-on-player survival. 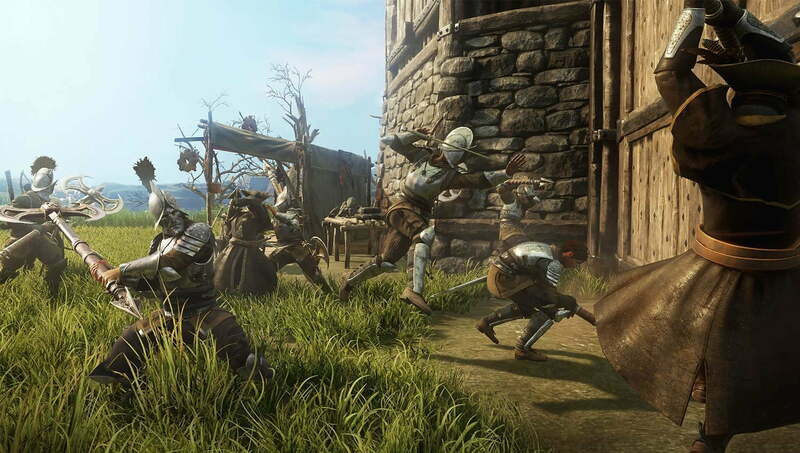 We don’t really think of it as a new genre, but we are striving to introduce new features that make the New World experience distinct—skill-based combat, persistent and large-scale settlements, leveling trade skills and progression, formalization of rules to coordinate large-scale player wars, and more. Scot Lane, Game Director, New World: I’d like to add to that. First, I am a huge fan and player of World of Warcraft and other MMO’s. While both games are MMOs, New World is a Sandbox MMO whereas today’s MMO’s are considered Theme Park. 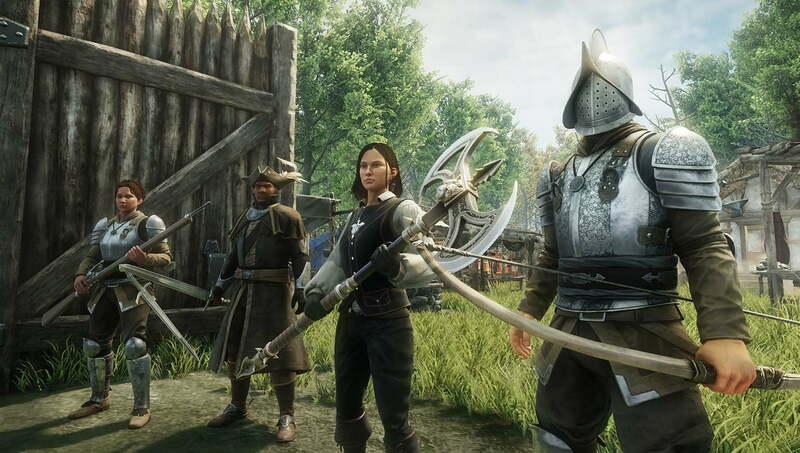 Sandbox MMO’s offer the freedom of choice. Characters explore the game on their own terms and for the most part enjoy open-ended goals that allow them to explore all the world has to offer at their pace. Another difference is in New World you can change the world, cutting down trees, harvesting plants, building settlements, farms, and so on. Finally, most MMO’s are tab-target, while New World features physical-based combat that is skill based. That’s not to say MMO combat isn’t skill based, because it is. But in most MMOs, a 10-level advantage is insurmountable. In New World, higher level players will have higher attributes, but a more skilled level 10 player will have a fighting chance – pun intended! – against a level 20 player. How harsh will landing in New World be? Will players be able to freely kill other players, and if so, what’re the consequences? And on the flip side, what’re the incentives for cooperation? Gilmore: We have a goal to make the best onboarding experience of any similar game, so hopefully not too harsh. Having said that, the spine of the game is player versus player combat. 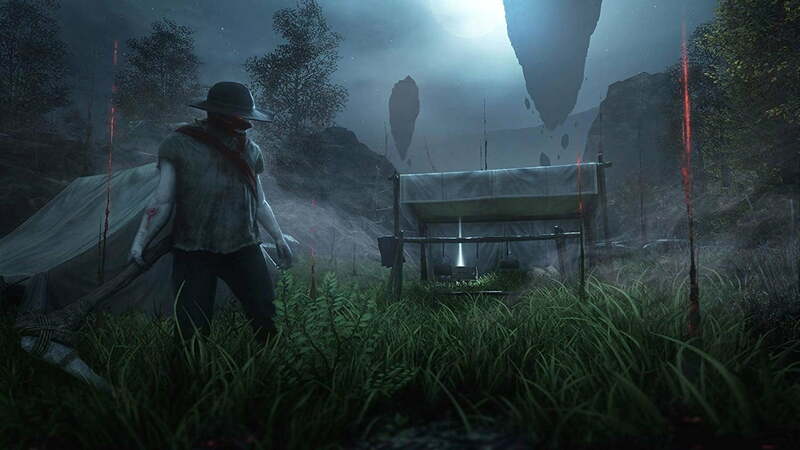 You’ll probably be murdered in New World. I was, in the first days of the Alpha. I lost a lot, and I was pretty mad. I came in the next morning determined to give players tools to create a more peaceful world. 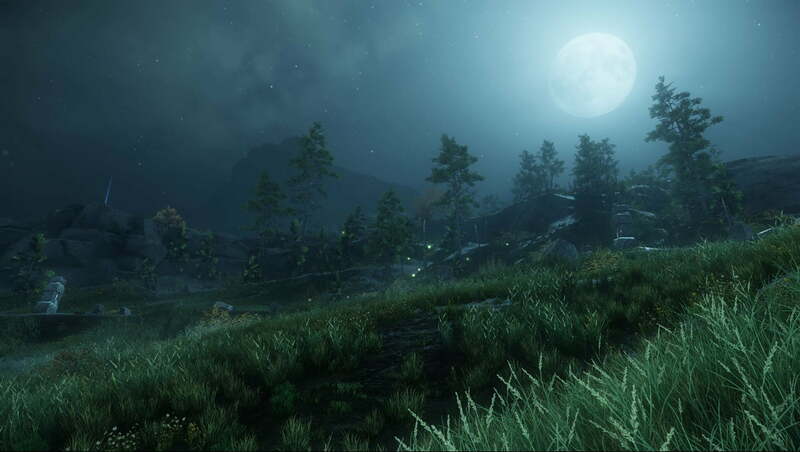 But over time, and with the patient counsel of people like Rich, Scot, and lead designer John Liberto, I came to realize that the constant press of danger was fundamental to the thrill of the game—making New World a peaceful world would deprive players of the stakes and drama of trying to forge a new life in an uncaring and supernatural wilderness. So, yes, players will be able to freely kill other players, but we have a number of systems like Sanctuary and Criminal Justice, which add interesting consequence and drama to that experience. Killing other players is not free. The danger of the world, and the fun of adventuring with friends, are great incentives to cooperate, and they’re both tied to the inherent peril of the world, and other players. The other end is, “I’m at war and expect no quarter. That’s a deliberate choice, and you can prepare for it. We can and will adjust either end until it feels the most fun. 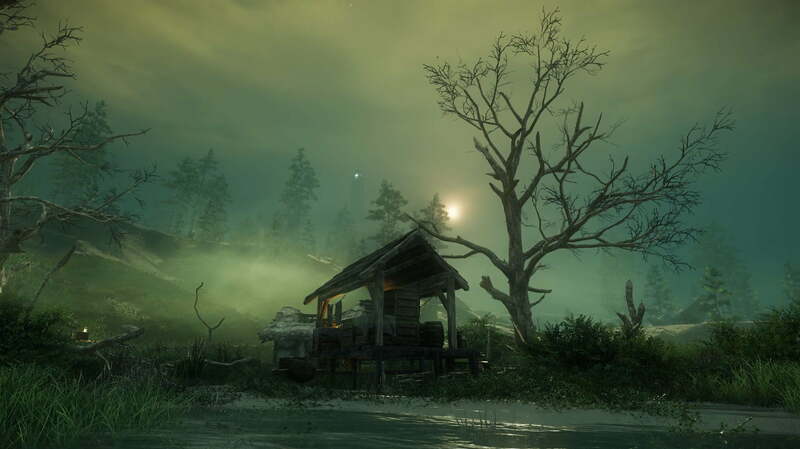 What does player progression look like in New World? Since there are no classes, what other systems are put in place so characters can advance and reach higher-level gameplay? Lane: We have a Progression System that consists of two main categories; Attributes and Skills. Attributes make the player more powerful and versatile. Skills make the player better at things they do in the world like Blacksmithing, Logging, and Wilderness Survival. Together these provide a complex but sensible means of building a character. Players earn experience by doing things in the world and then at certain intervals they level up and will earn Attribute and Skill points they can assign and use. 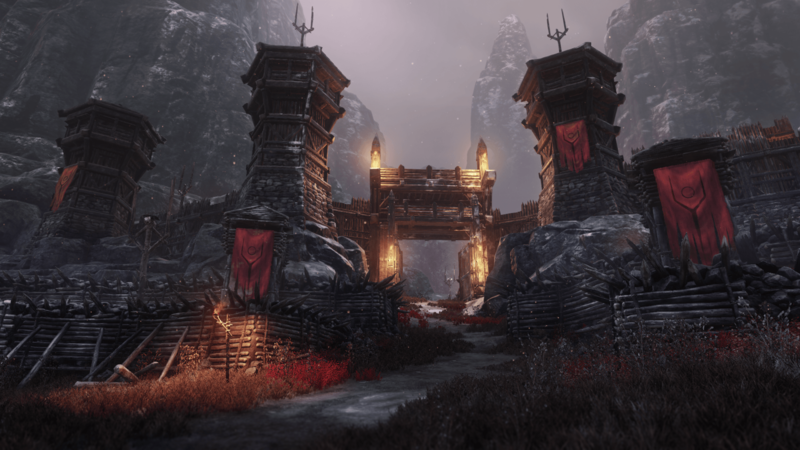 This enables more casual players to progress their characters in the way that is most interesting to them, while also enabling build optimization and min-maxing for more invested players. So while we don’t have classes, you can build a “Soldier” by spending attribute points on Strength and Endurance, and your Trade Skill points on Blacksmithing so you can create heavy armor and melee weapons. Lawrence: Progression appears in several ways – most obviously, there are levels, and with levels come trade skill and attribute changes. Skills are ideas like being an engineer, an alchemist, or a blacksmith. Attributes are characteristics of your avatar in game – how strong you are, smart, and the like. You can pick combinations of the two that are complimentary (a strong blacksmith) or diverse (an archer-based alchemist) based on your tastes. A less obvious progression is your equipment – what you wear and how you use it changes how you play the game, and has trade-offs in gameplay to consider. For instance, being a healer isn’t a class choice, it’s attributes combined with specific equipment that excludes your ability to wield certain other equipment. Crafting and economy are said to be central pillars of New World. They’re also notoriously difficult to get right because players often think up creative ways to game the system. 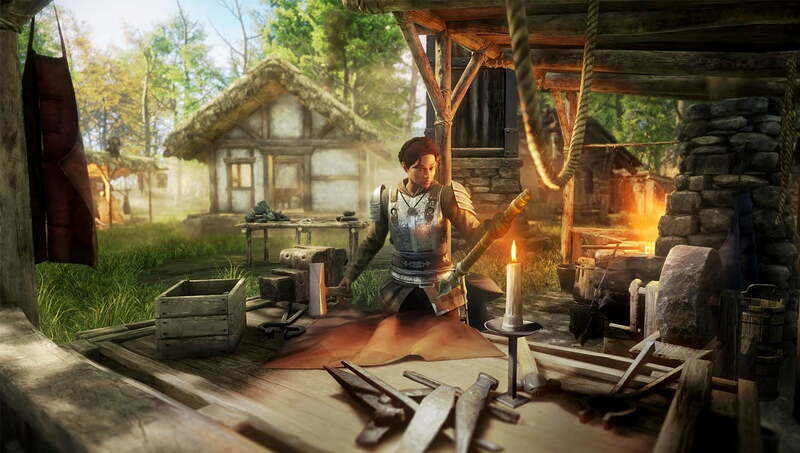 What is Amazon Game Studios doing to get the economy and crafting right? Lane: You are right, players are great at thinking of ways to exploit systems. First and foremost, we have been testing with live customers for several months now and will continue to do so until we feel confident that the systems are solid. And our design team works closely with our Product Management and Business Analytics teams doing regular economy reviews and modifications. In this type of game, it is essential we measure and monitor these features, so we are putting a lot of effort into getting it right. Lawrence: Oh, we’re fully expecting players to surprise us with their creativity. Gamers as an audience are very informed and dedicated to finding the frayed edges in the fabric of your design and pulling that loose thread. There’s a lot of complexity to this subject, it’s about preventing automated abuse of the economy, dealing with changing natural supply curves over time based on state of gameplay, not rewarding hoarding, and more. I think the best quick summary is we want to put as much of the balance in the hands of the players as possible, but we have plenty of dials and drains to exercise when something get in the way of fun. At the same time, if you manage to be the player who briefly monopolizes the steel market or what have you, that isn’t necessarily a bad thing, until players have no ways to solve the problem. One player solution for a New World steel cartel would be to band together and invade their territory, which would be cool to see!